Originally published by Legal Centre Lesbos. Written by Lorraine Leete. The situation has predictably worsened in Lesvos. On the 17 April 2018, the Greek Council of State (the highest administrative court in Greece) ruled that geographic restrictions imposed by the Asylum Service for asylum seekers arriving to the Greek islands was illegal. However, within a week, new legislation was proposed, which further limits the rights of asylum seekers and continues the practice of containing asylum seekers to the Greek islands. Moria Camp is now at three times its capacity, holding approximately 7000 individuals. Between 500 and 1000 Kurdish asylum seekers are still living outside Moria in temporary shelter provided by Lesvos Solidarity – Pikpa, and Humans 4 Humanity, as they fear for their safety in Moria. Procedures are now so delayed that even individuals who are recognized as vulnerable, and whose cases should be prioritized under Article 51 of Greek Law 4375, are being scheduled for their interviews nearly a year after their arrival. This means that they are prohibited from leaving the island of Lesvos, and are denied freedom of movement during this entire time. In one case we are following, an eleven year old child has a serious, undiagnosed digestive condition that causes her constant pain and seizures. Because they have been unable to diagnose her illness, the hospital in Mytilene has referred her for testing and treatment in Athens. Even the Mytilene police department has recommended that geographic restrictions be temporarily lifted so that she can travel to Athens for further tests and treatment, but the Regional Asylum Office has denied this request without an appointment in the Athens hospital. Her family is now in a constant state of fear that given her critical condition, their daughter will be unable to receive emergency medical care when needed, given the lack of testing and treatment for her on the island. Already once, when she had seizures and attempted to get treatment at the hospital in Lesvos, she was not admitted because they do not have means to treat her. The Green Party published a report on 6 June 2018 exposing the inhumane conditions that systematically violate refugee rights in the Greek hotspots. On the 1 June 2018 the European Committee for the Prevention of Torture (CPT) also published preliminary observations of its visit to detention facilities in Greece from 10 to 19 April 2018, with damning findings. In the last month and a half since the conclusion of the Moria 35 trial, we have been closely following the administrative process related to the detention and processing of the asylum claims of these individuals. 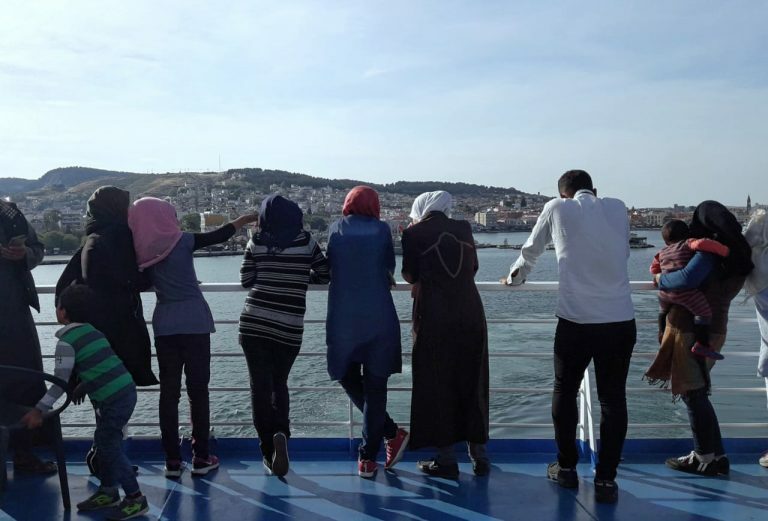 It has become a near full time job of our Greek attorney based in Mytilene to ensure that Greek authorities comply by their own laws and respect the rights of these asylum seekers. Despite the fact that the UNHCR, the Ombudsman’s Office, and the Legal Centre have been closely monitoring their cases, there have been rampant violation of their rights at every step of their procedures. Unfortunately despite this close monitoring, two individuals were deported to Turkey on the morning of 13 June 2018. The violations we have observed in the individual cases of these 35 men highlight the lack of procedural safeguards to protect the rights of asylum seekers, particularly those who are being detained. Two individuals whose cases were rejected were denied the representation of a lawyer on appeal. The appeal of a rejected asylum claim is the one stage in the asylum procedure where asylum seekers have the right to a lawyer, under Article 44(3) of Law 4375. Although both requested the representation of a lawyer, the examination of their case on appeal occurred without them having been assigned an attorney. Another individual signed for voluntary departure, but then changed his mind and decided to continue his claim for international protection. He requested that his case be reopened. While that request was being processed, he was placed by police on the list to be deported on the 1 June 2018. It was only after advocacy from the Legal Centre that he was removed from the deportation list. He remains in detention, despite the lack of legal grounds to hold him there. Another individual was held for over a month in detention, after transfer to Lesvos following the trial in Chios. There was no recommendation for his continued detention either from the Regional Asylum Office, as required by Article 46(3) of Law 4375. After daily follow up from the Legal Centre, eventually the police admitted that they were holding him by mistake and he was released. Two additional individuals had their asylum cases rejected, but were unable to appeal because they were detained. With advocacy from UNHCR and Legal Centre lawyers, one of the individuals was able to lodge his appeal. However, he remains in detention, and it is not clear if the Appeals Committee will review his case on the merits or deny the appeal as untimely filed. The second individual was deported on the morning of 13 June 2018. This was despite the fact that for days he had been expressing to the police his desire to appeal the rejection of his asylum claim. Lawyers from HIAS and the Legal Centre also spoke with the Mytilene police department the day before he was deported and informed the police that they would be filing an appeal on his behalf. On the morning of 13 June 2018, he was deported to Turkey. This individual, a Guinean national, claims that he was a victim of torture, and will be subject to persecution if returned to his country. Regardless of whether his claim is credible, he has the right to appeal the rejection of his claim. Even though untimely, it is not the police who have the authority to accept or reject his appeal, but the Asylum Service. His right to appeal was clearly denied, and his deportation was illegal as police were aware that he would be appealing the denial of his claim and they proceeded with the deportation in any case. A second Moria 35 defendant was also deported on the 13 June 2018. His case had been rejected in the second instance. In 2017 this Ghanean national had been rejected and scheduled for deportation, but he lodged a subsequent application. It was the denial of this subsequent application that led to his deportation. While the Regional Asylum Service again scheduled for him to file a subsequent application on 14 June 2018, on 11 June 2018, we were informed that they would not accept a second subsequent application, since he had already submitted a subsequent application in 2017. However, he still had the option of appealing the denial of his claim in administrative court. Less than two days after being informed that he could not file a subsequent application, he was deported to Turkey. This individual has recently received original documents from Ghana that were not previously submitted to the Asylum Office. These documents corroborate his claim that he will be imprisoned 10-15 years if returned to Ghana. Prison conditions in Ghana according to human rights reports are “generally harsh and sometimes life threatening due to physical abuse, food shortages, overcrowding, and inadequate sanitary conditions and medical care” meaning he should be eligible for subsidiary protection, if not refugee status. Both individuals that were deported on the 13 June 2018 are also eligible for humanitarian protection as important witnesses to a serious crime that is still being investigated in Greece (the brutal police attack against the 35 arrestees on 18 July 2017). The swift move of the police to deport these individuals show that while procedures to grant protection and ensure that refugee rights are respected are constantly delayed, the State is able to mobilize and act swiftly to deny these same rights. The trampling of the rights of these individuals by the police has followed their brutally violent arrest, their unjust prosecution, and lengthy imprisonment in the case of the Moria 35. It is not clear if the police have targeted these individuals precisely because they were part of the Moria35 case, or if the violation of detained asylum seekers rights is systematic. What is clear is that there is a lack of sufficient transparency, oversight, and monitoring of detention and deportation practices. Despite this hostile environment, we continue providing legal aid and individual consultation to all foreign nationals who seek our counsel. We conduct approximately 10 individual consultations daily, and through the assistance of our volunteer lawyers and interpreters, hundreds of individuals have been granted international protection in Greece, or have successfully had geographic restrictions lifted so they can legally travel to mainland Europe. We also continue to have success in assisting individuals in reuniting with family members in second European States under the Dublin III Regulation. In one case, a single young man from Haiti who is seriously ill was approved to be reunited with his family in France. While in Haiti, he had attempted to apply for a visa to join his parents and younger siblings in France, but was denied because he was over 18. France finally admitted, through our advocacy, that he was dependent on the care of his family, and that he should be able to join them in France. The fact that this individual was forced to take a lengthy, expensive, and dangerous journey to Europe through Turkey and the use of smugglers, only to be later admitted as an asylum seeker in France, shows that European immigration policies are broken. We will continue our work to assist and help navigate individuals through this broken system, and to monitor and expose the violations of these individuals’ rights when they occur. Mutual aid: Some of the Enough team are in Bosnia again. Together with the Cars of Hope collective they will support refugees there.